March 26, 2019 – When it comes to early season soybean advice, Golden Harvest Agronomist Stephanie Smith encourages farmers to plant in time for full canopy closure by June 21, the longest day of the year, to maximize photosynthesis. Source: Tom Bechman – Field Editor – Indiana Prairie Farmer in Franklin, IN. 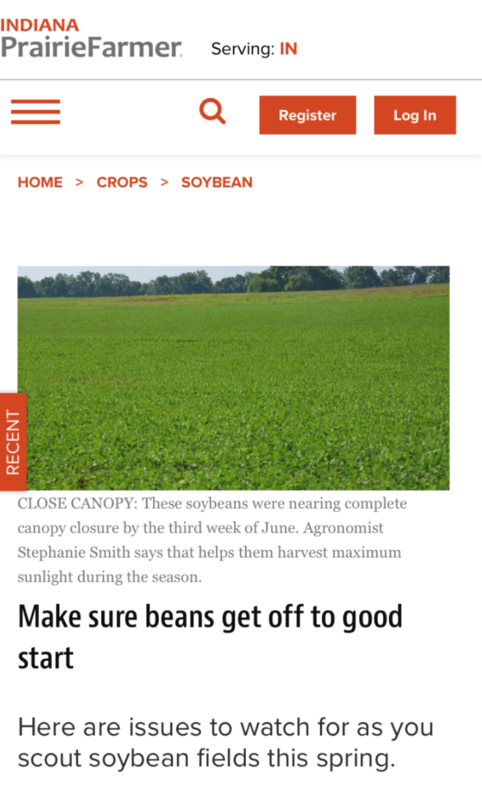 https://www.farmprogress.com/soybean/make-sure-beans-get-good-start Indiana Prairie Farmer is geared to provide Indiana farmers local production information. Offers information and advice to livestock and grain farmers, including legislation updates and analysis, business and management news, machinery and equipment innovation and use, new products and pollution and environmental issues. Also profiles farming personalities and communities. Learn more at http://www.indianaprairiefarmer.com/.